Amy Stolls’ site is a great example of design collaboration, incorporating our own ideas and those of our customer. We developed a textured, vibrant, friendly looking layout for Amy, and then incorporated photos of stuffed animals she sent us to make each page’s heading a little bit different. It’s also as functional as it is beautiful. Every time Amy wants to post to her blog, she can automatically forward that post to her Twitter and Facebook accounts. 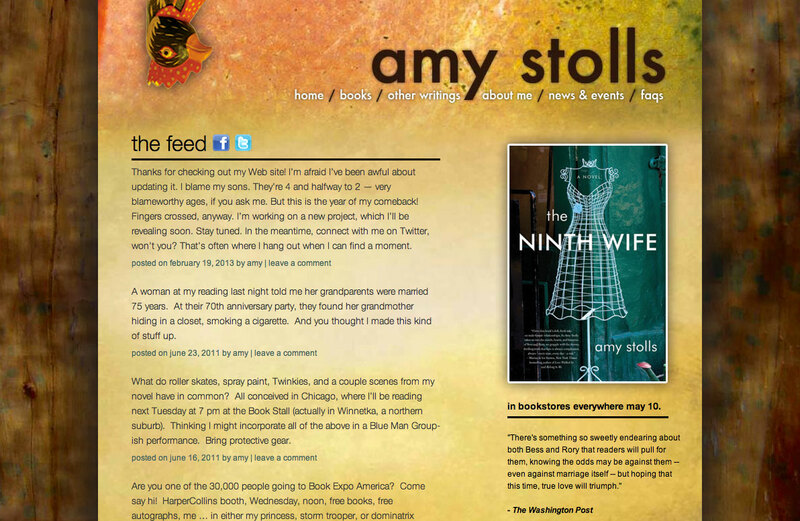 Amy Stolls is the author of the novel The Ninth Wife (HarperCollins, May 2011), and the young adult novel Palms to the Ground (Farrar, Straus & Giroux), published in 2005 to critical acclaim and a Parents’ Choice Gold Award. She spent years as a journalist covering the Exxon Valdez oil spill in Alaska before she received an MFA in creative writing from American University. Currently, she is the literature program officer for the National Endowment for the Arts, collaborating with thousands of writers, editors, booksellers, and publishers.